There’s some good news for fans of NBC’s ailing Heroes TV show. Though the sci-fi series has been struggling to hold onto its audience, the network’s entertainment prez says there’s no plans to cancel the super-powered ones. Still, the show isn’t in the clear just yet. Heroes revolves around ordinary individuals who are suddenly endowed with amazing powers — super abilities that cause them to become both hunted and feared. The large ensemble includes Sendhil Ramamurthy, Jack Coleman, Masi Oka, Hayden Panettiere, James Kyson Lee, Milo Ventimiglia, Ali Larter, Adrian Pasdar, Greg Grunberg, Zachary Quinto, Cristine Rose, Ashley Crow, and Noah Gray-Cabey. The NBC series debuted to 14.3 million and a 5.9/14 rating/share of the 18-49 demographic. Viewership both fell and dropped in Heroes’ freshman year and it ended up averaging 14.3 million viewers and a 6.4/15. The second season was largely disappointing to viewers and was artificially shortened due to the writers strike. It averaged just over 13 million. Will season four be Heroes' last? Heroes returned over nine months later for season three and just over 10 million viewers. It’s essentially been falling ever since and the latest installment attracted just 7.04 million and 3.2/7 in the demo. Trying to allay cancellation worries, Angela Bromstad, NBC’s Entertainment President, has told the Hollywood Reporter that the network plans to renew the show for a fourth season. It’ll be a shorter-than-usual cycle though and is expected to be just 18-20 episodes. However, as the Reporter’s James Hibbard notes, this is not an actual renewal and the network execs could still change their minds. That’s a far cry from the confidence of last season’s renewal which came in mid-February, months ahead of the advertiser upfronts. Heroes’ viewership has been falling and, if it continues to do so, the network may have no choice but to change their plans. For the time being though, the network is committed to keeping Heroes on the air. There are discussions about giving the series a set end date (like Lost) but the ratings-starved network isn’t ready to commit to that strategy for the time being. Granted Heroes could stand to be a bit more consistent with the plot but overall I am a die-hard fan. Iwould atleast like to see what the writers come up with now that the secret is officially out! (thanks Claire) lol. 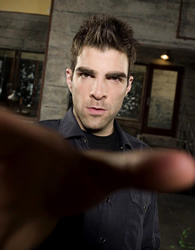 nbc would be stupid if they canceled heroes its one of the best shows on tv and shorting it would be stupid also what they need to do is add a new bad guy someone other than sylar and put the focus more on peter,matt parkman,clair,hiro,and ali larters character. Heroes is so damn addicting! I watch in anticipation; sitting on the edge of my seat! I have never felt this way over tv, never. At maybe 5 minutes to the end of the show, I have this overwhelming sense of sadness; heroeskitzofanaticism. I LOVE Heroes! Yes, there has been some episodes not as pleasing as others, but I needed those episodes to get my weekly fix! Season 4 you are most welcomed into my home! Well, i wasn’t a fan of Heroes not until a friend downloaded the first and second season to my hard drive and after that….I was going GAGA over Heroes! It’s an awesome show and those people who keeps on saying bad things about HEROES are jerks who have nothing to do but leave an ugly comment. Just try to appreciate the little things people do for entertainment, at least, they ave brains!!! I believe that all the Heroes seasons were awesome it was just that the people are dumb and just say it’s the worst show ever cause they have nothing else better to do. HEROES IS AWESOME!!!!!!!!!!!!! Heroes is one of the greatest shows ever. Season 2 was disappointing Ill admit but Season 3 was AMAZING especially the second half of it. This is what tv needs, shows that are unpredictable. I was sad to see season 3 end, and now season 4 could turn out to be better than the 3rd. I can’t wait for season 4 to come out!!! ABC is cancelling Kyle XY, which is 100 times better than Heroes, and NBC is just giving them another chance? Stupid TV networks. I just hope the Internet finally takes over TV forever. There are good shows cancelled, what about cancelling a bad as hell show for a change? Season 1 was awesome and until season 2 Heroes was one of the best shows ever. But since 2 it got worse, and worse and worse. It’s now just as bad as Prison Break (which got worse since season 2 too).